Two of my favourite discoveries while I was living in Beijing were 地三鲜 (disanxian) and 豆腐白菜汤 (doufubaicaitang). 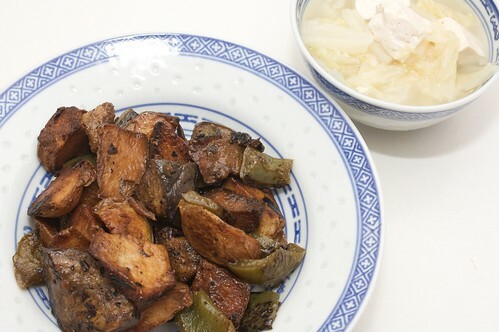 地三鲜 is the greatest eggplant dish ever, featuring the 'three earth treasures', a complicated and oil heavy (but delicious!) combination of eggplant, potato and green capsicum in a soy saucey roux. 豆腐白菜汤 in contrast is a simple soup made up of tofu, chinese cabbage, and not a lot else, which is deceptive in its tastey-ness. It looks really boring and sounds really plain, but it's actually one of my favourite soups ever. Be warned if you order either of these in restaurants, though - sometimes they're made with chicken stock! As I have mentioned before I learnt how to cook a lot of dishes during my year in China, and I hope to share a lot of them with you now that I'm back in my own kitchen and trying them out here at home, but these are by far my favourites and hence why they were almost the first thing I cooked upon my return. 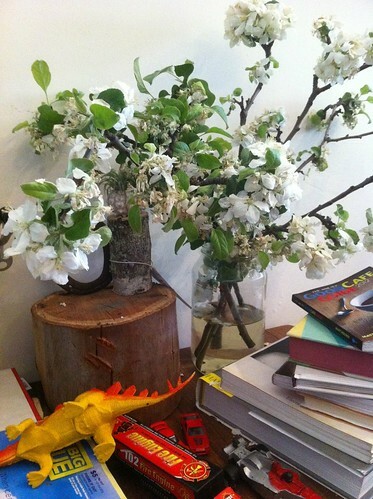 The delay in blogging them is mostly because I was too lazy to translate out of Chinese and into English for you. Sorry! I promise I do love you! I'm posting these two recipes together because I only have the one picture - tofu and cabbage in a white bowl on a white background makes for the brightest photo ever! So it didn't really work out. 1 big eggplant (or 2 small eggplants), cut into chunks that are about twice as big as the potato. Bring up the heat on your wok and load it up with some oil. Fry the potatoes until golden! Remove them, and (in the same oil, add more if necessary) fry the eggplant until golden! Fry the capsicum for a minute or two! Remove most of the oil (if you need to, I usually use just enough oil from the beginning that by the time I get to this stage there's not much left whoops), leaving just enough to do some stirfrying. Fry the garlic, then add the stock and the soy sauce. Bring the soup to a boil, and thicken it, then add the vegetables and give it all a chance to reduce. You want this dish to be a little saucy but not too much! Fried and delicious, it's so tasty. Serve with other dishes and something carby. I would just like to reiterate that there are no words to describe how much I love this soup. It can also be served with some rice noodles, but I like to have it as a final dish in a banquet. Bring stock to a boil and add the ginger, salt, cabbage and rice wine, as well as the soy sauce and star anise if you're adding it. Allow to simmer, covered, for 15 minutes, then add tofu, and allow to cook through (about five minutes). Add (rehydrated) mushrooms, noodles, or sesame oil at this point if you're adding them. Serve with your meal. It's delicious. As soon as I got back to Melbourne, as per discussion with Wendy, I started search Melbourne's Chinese grocers for Very Important Ingredients, in case she would have to sneak them in on her return. Then, just over a week ago, my cookbooks arrived in one of my boxes posted from China, and I was able to start the joys of replicating the things I learnt. One of the things I was looking for was sichuan peppercorns, which Cindy kindly provided to me, on the condition that I write up the things that I cooked with it. And I am happy to oblige! I was tweeting with my friend Stefefanie (defined so because I am the Steph who came first) at the same time as deciding on this recipe, and she mentioned that dan dan mian is a go-to dish for her because it's so easy. I'd suggest, it's an easy recipe if you don't decide to a) grind your own sichuan peppercorns, and b) also decide to make your own infused chilli oil before starting. * It's still pretty easy, though! And super delicious. a whole lot of chilli oil, enough to make it super spicy but not so spicy you couldn't eat it, this will vary on your chilli oil and your tolerance. i recommend five or six tablespoons. some noodles! enough for two people. preferably yellow wheat noodles, but whatever you prefer is fine. soak the mushrooms in some hot water for 20-25 minutes, until they're soft. squeeze out all the water, and dice them as finely as you can. reserve the mushroom water. cook the noodles as per your requirements! in the meantime, make the sauce: combine all the sauce ingredients together, add in the mushroom water, and mix them until they're looking well combined. Put this aside, and when the noodles are ready, drain the noodles. in your wok (or a frypan), fry the garlic, ginger and the white bits of the spring onions in the peanut oil until they're fragrant, then add the tempeh, carrot and mushrooms. fry this until it's starting to colour/cook, then add the soy sauce and fry through. add the rice wine at the end to deglaze and remove from heat. 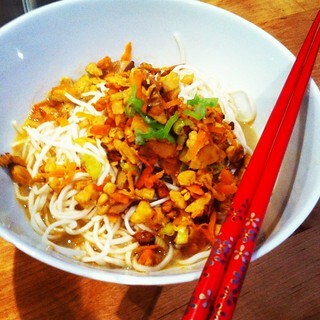 to serve: noodles in the bottom of the bowl; pour in half of the sauce mixture, and layer the meat mixture on the top. garnish with the green bits from the spring onion. changes: this dish is often served with bok choi, which is first steamed and then layered in before the meat; sometimes this dish is served dry ish, as here, and sometimes it is served as a spicy oily chilli broth with a few pieces of noodles and meat, in which case double the sauce proportions and leave the rest as is. Paused for a cup of tea and a slice of cake at Storm in a Teacup this afternoon. Another place that has opened since I left Melbourne, I was delighted to find they had some vegan cake and a variety of Chinese green tea I've never had before, listed as maojian but which I'm assuming is actually 信阳毛尖, which was lovely. Storm in a Teacup is a tea cafe, with a wall of teas available (though you'll have to take my word for it as the photo failed to work out). It has a lovely atmosphere, light and airy and chilled, which is a stark difference to its previous life as Trippy Taco before it moved around the corner. The walls are decorated with clouds, which suggest some cocktails (I mean that literally - there is a tea cocktail menu inside the clouds). It also has some cakes! 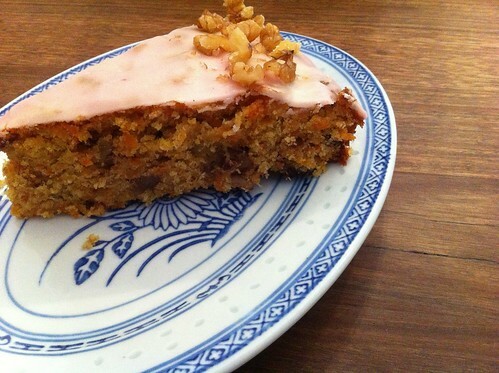 Today's vegan cake was carrot and walnut with blood orange icing, and it was lovely! Moist and a little fruity, combined with my tea and the delightful company of my friend A, and the lovely service, it was a wonderful hour late in the afternoon. Step to enter, not much seating, bright in the day (unsure at night). I am completely out of the habit of blogging in Melbourne, and I still have half a dozen posts I want to make about my time in China,* but I have started eating again in Melbourne and adventuring to exciting new places, and I don't want to too far behind in that. So: Wide Open Road! While I was living in China,** the new place I heard the most about was Wide Open Road, situated near Sydney Road and Barkly Square at the bottom end of Brunswick. As I'm currently between jobs, I'm endevouring to take advantage of this by having as many weekday brunch outings as possible (because good vegan brunch is basically impossible to get in Beijing, and I need to make up for lost time), and used one of my early brunch opportunities to visit Wide Open Road. It was a beautiful warm day, so Emilly and I sat outside in the glaring sunlight, unfortunately situated on Barkly Street, outside Barkly Square, so it's not the most pleasant of sidewalk seating areas. 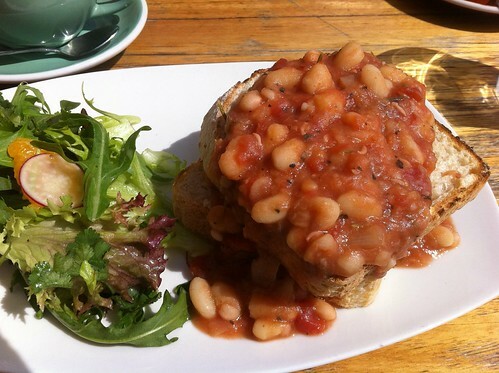 But the inside is lovely and the coffee is pleasant, and I loved these tomato and smoked paprika beans so much. The paprika is lovely (though could have been a bit stronger), and they soaked into the bread delightfully, and I loved that it comes with a salad. The only thing that could possibly have made it any better was avocado; but then, avocado makes most breakfasts better. Emilly had the tofu (not pictured), which she said was good but not very moist, so it didn't soak into the toast at all and as a result could have done with some olive oil or something. I have been talking the beans up to all my friends, and there are heaps of vegan options on the menu, and I hope to return there soon. Two (?) steps to enter, dim visibility inside but that could have been due to the brightness outside. Ordering and paying can happen at the table. Get there via the 19 tram (5 mins walk from a stop) or the Upfield train (ten minutes meander from Jewell Station). recent vegmellians at wide open road: Carla (who tried a previous iteration of the beans, judging from the picture); Johanna. **See what I did there?